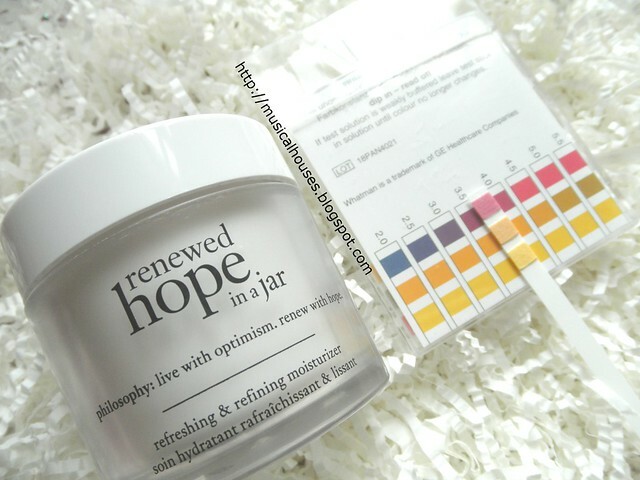 Philosophy Renewed Hope In A Jar Review and Ingredients Analysis! 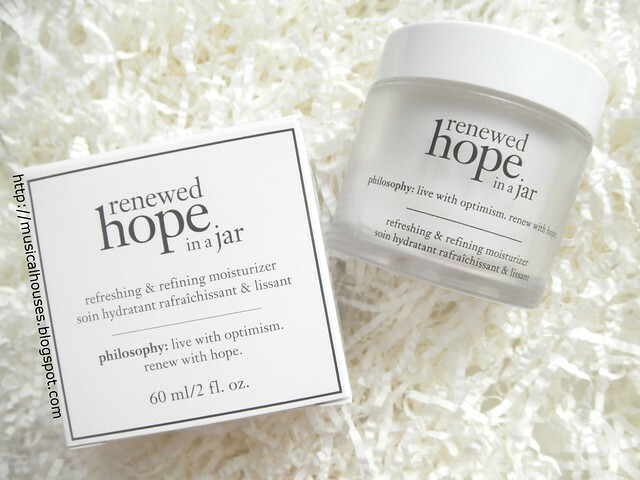 Philosophy's Renewed Hope In A Jar moisturizer, as the name suggests, is a "renewed", new and improved version of Philosophy's iconic Hope In A Jar moisturizer. 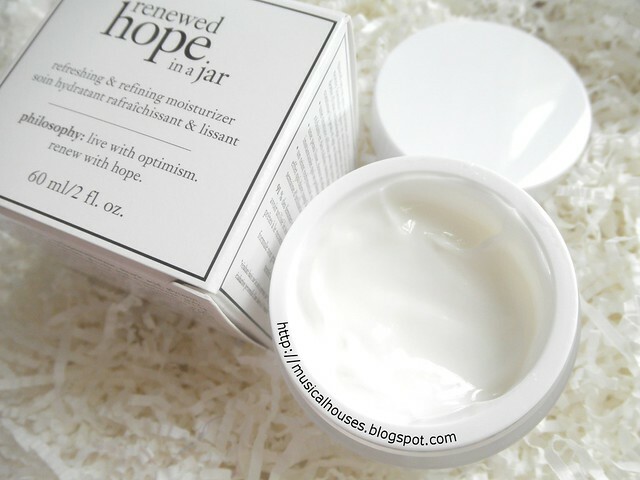 I happen to be running a giveaway for a jar of Philosophy Renewed Hope In A Jar and Purity Cleanser right now (which you can enter if you are a Singapore resident), so I figure that there's no better time to do a review of the new Renewed Hope In A Jar! 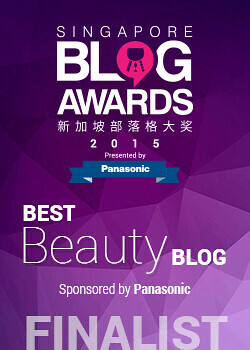 According to the Philosophy website, the "the revolutionary lightweight, whipped formula of hope in a jar is renewed and infused with a new innovation: clinically proven skin renewal technology", in particular "a triple blend of alpha hydroxy acids, 3 forms of hyaluronate plus an asian fruit extract". The old version was already pretty popular, so I imagine the new one is going to turn some heads! I'm a big fan of acids, and both AHAs and BHAs have both worked well for me in the past, so I was definitely keen to try this out! And if you're like me, chances are you're probably pretty excited about the AHAs too, and you're probably wondering - what are the AHAs that are in the product, and is the product formulated to allow the AHAs to function optimally? And also, are there any other benefits beyond AHAs in this product? Don't worry though - we're going to look at all of these questions in my review. It's going to be a bit long, because we'll be looking both at the overall formulation of the product, as well as aspects of the product that are specific to AHAs (e.g. the AHAs inside it, and the pH of the product), but I hope it will be worth it! This also means we're going to get comfortable spending some time getting to know our ingredients list, so let's get started! 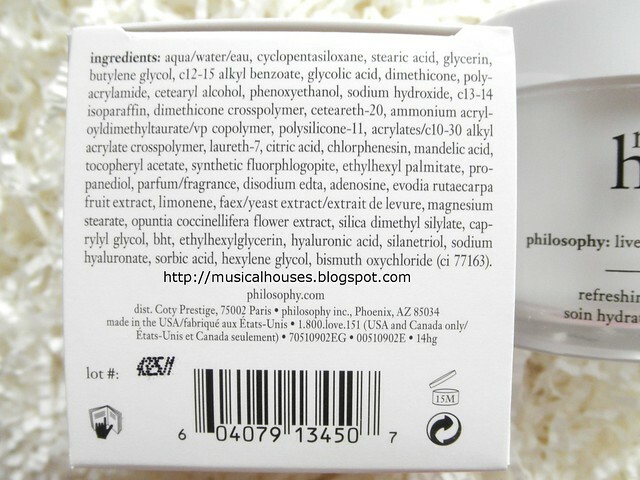 The main ingredients in the Philosophy Renewed Hope In A Jar are water, emollients (Stearic Acid, C12-15 Alkyl Benzoate, Cetearyl Alcohol), silicones (Cyclopentasiloxane, which evaporates quickly upon application to disperse the other ingredients, and Dimethicone, which helps the product feel nice but also has some emollient effect), humectants (Glycerin, Butylene Glycol), Glycolic Acid, and film formers (Polyacrylamide). After that, we reach the main preservative Phenoxyethanol, and pH adjuster Sodium Hydroxide, both of which are typically used in low amounts. Phenoxyethanol in particular is typically used in amounts of 1% or less, so the rest of the ingredients are there in fairly low amounts. The rest of the ingredients include more emollients (C13-14 Isoparaffin), silicones and polymers (Dimethicone Crosspolymer, Ammonium Acryloyldimethyltaurate/VP Copolymer, Polysilicone-11, Acrylates/C10-30 Alkyl Acrylate Crosspolymer), humectants (Hyaluronic Acid, Sodium Hyaluronate), functional ingredients like emulsifiers (Ceteareth-20, Laureth-7), pH adjusters (Citric Acid), preservatives (Disodium EDTA), Vitamin E (Tocopheryl Acetate) as well as another acid, Mandelic Acid. There are also some ingredients such as fragrance, and a variety of plant and other extracts (Evodia Rutaecarpa Fruit Extract, Limonene, Faex/Yeast Extract/Extrait De Levure). 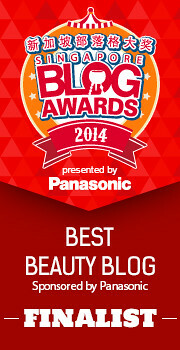 There might be some people who are not a fan of fragrance or some of the potentially irritating pant extracts (e.g. Limonene), but they are there in pretty small amounts (less than 1%), so I think that for most people, those ingredients wouldn't bother them in such low amounts. Now that we've taken a look at the overall formula, I'd like to dive deeper into one of my favourite ingredients in this product - the Glycolic Acid! 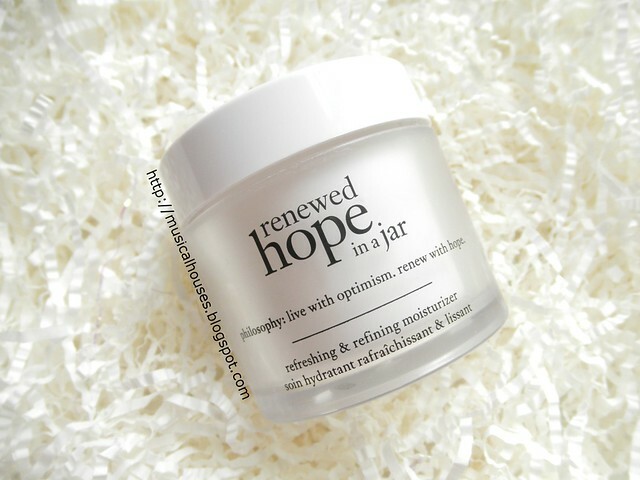 From the ingredients list, it seems like the Renewed Hope In A Jar actually has a good amount of Glycolic Acid for a non-prescription product. I'm personally a big fan of Glycolic Acid products, as I'm generally a fan of AHAs and BHAs in general, and Glycolic Acid is one of the more effective AHAs with a stronger body of publicly-available research behind it. Glycolic Acid is primarily a great exfoliant, and helps to slough off the older skin cells on the skin's surface to expose the younger skin underneath. Because it helps in aiding skin turnover, it's often used most commonly in anti-ageing products, as well as for acne treatments (in addition to BHA). The good thing about Glycolic Acid is that it's also actually still effective even when packaged in a jar, unlike some other actives (ascorbic acid and retinol being a couple of the more obvious ones). So yes, while the jar packaging may seem fussy, rest assured that functionally, it's fine. Packaging aside, another important consideration with acids is the pH of the product. Obviously, if you want an acid to exfoliate, the product has to have a fairly low pH to work. For glycolic acid, the peels you get in a doctor's office can be as low as pH2 (which is why you should never try to replicate at-home peels with doctor's stuff if you don't know what you're doing! 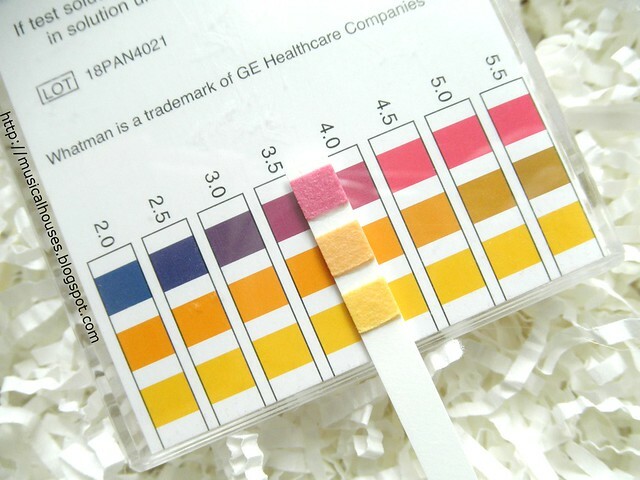 ), but in most non-prescription products, the pH is usually in the range of 3-4 instead. In this case, we would ideally want a pH within that range, because any higher, and the product becomes less effective. With that in mind, I took out my trusty pH strips, and did a quick dip with the product, and did indeed get a reading of somewhere between pH3.5 and pH4, but seemingly closer to pH3.5 perhaps, as you can see from the photo above. 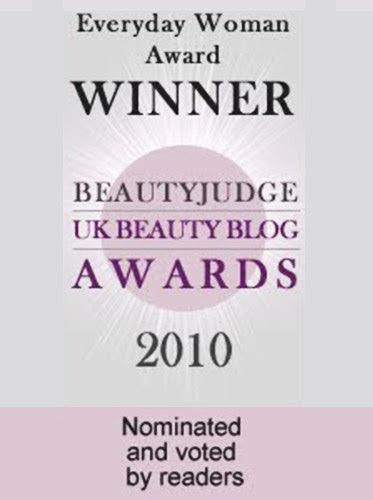 So yes, this is indeed within the pH range for effective exfoliation! So, I guess I don't have too many major quibbles with the formulation - looking at the ingredients list, it seems like the Renewed Hope In A Jar is formulated to be a good solid moisturizer, covering the basics of both having humectant and emollient properties. Also, it seems to have a decent amount of Glycolic Acid for exfoliation, at a pH that works, and in a packaging format that doesn't compromise the effectiveness of the Glycolic Acid. Looking at the ingredients, it's also clear why the reformulation of Hope In A Jar is such a big deal for Philosophy. those who are wondering if there is a difference between the old and the new version - the key difference, in my opinion, is really the addition of Glycolic Acid. The "original" Hope In A Jar claimed to have Lactic Acid (really Lauryl Lactate), which is also an acid, but a much weaker one, and the Lauryl Lactate form really doesn't exfoliate as much as straight up Lactic Acid would. The addition of Glycolic Acid really enhances the exfoliating properties of Hope In A Jar, which is always a good thing in my book! Of course there are other changes too, such as the additional plant extracts, the changing of some humectants and emollients, but to me, the addition of Glycolic Acid is the key difference between the two formulas, and the reason why I would prefer the newer formula over the old one. Now that we've looked at the formula, let's consider the aesthetics of the product! Philosophy advertises this as having a "souffle"-like feel, and it does have a lightweight feel - not thick or too sticky or too oily at all, although it certainly functions well as a moisturizer. It also has a light citrus scent that dissipates upon application. Glycolic acid products can sometimes sting the skin if you are using them at a high concentration and/or you are new to using acids on your skin, but when I was using this product, I didn't feel any stinging sensation, unlike some other stronger Glycolic Acid products. This could be due to the fact that the amount of Glycolic Acid is not that high, especially considering that it's a non-prescription product. My guess is that it would be in the low single digits, but it's hard to be sure. 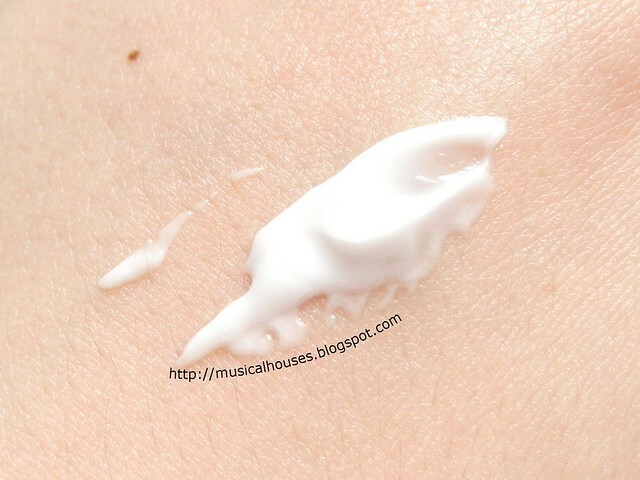 Nevertheless, over time, you would see an improvement in overall skin texture as the Glycolic Acid works on your skin. For me, I found that it was useful in refining my skin texture overall, although the process is not immediate, as compared to say, a peel you would get in the doctor's office. But on the bright side, the product is going to be safe for us and unlikely to cause any pain or stinging with use, so slather away! 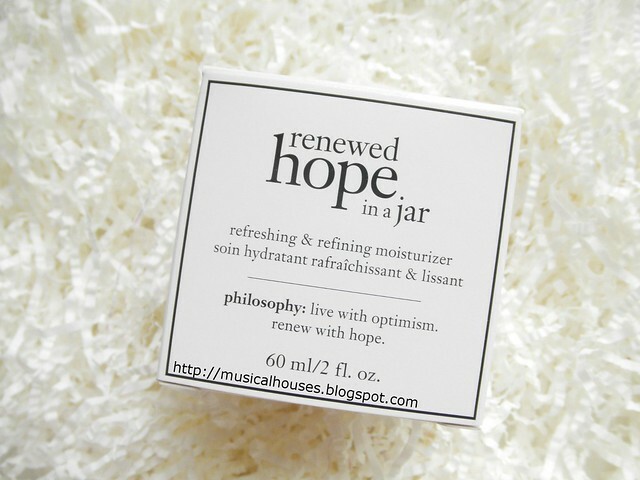 So, would I recommend the Philosophy Renewed Hope In A Jar? I think it's a good overall night moisturizer, with some great kickass exfoliating benefits to boot. 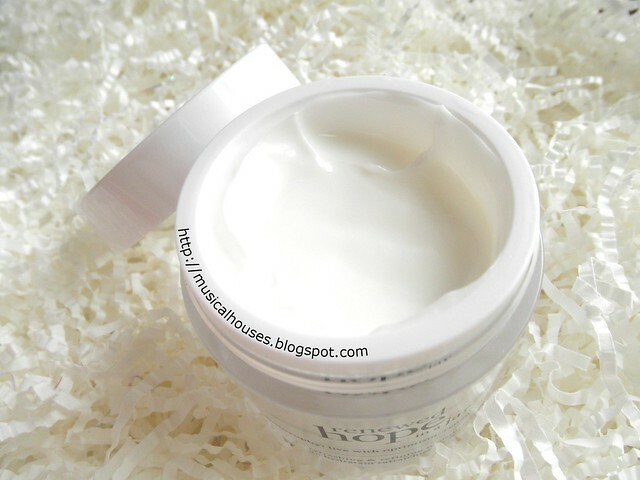 It's got both humectant and emollient ingredients to moisturize the skin. It also has Glycolic Acid in a decent amount that can help to exfoliate the skin, within the right pH range too! I also liked the lightweight, non-greasy texture, which makes it easy to use. I think this would be a good addition to anyone's general skincare routine, and particularly if you are looking for something that gently exfoliates as part of your anti-aging arsenal. At SGD$62, it's not the cheapest moisturizer around, but you can definitely spend more on less well-formulated products in the department store. If you do use it, I'd recommend using it at night, and use sunscreen in the day! The Bottom Line: Philosophy's Renewed Hope In A Jar is a moisturizer with a decent amount of glycolic acid, at the right pH to help skin exfoliate. you carry your own PH strips? 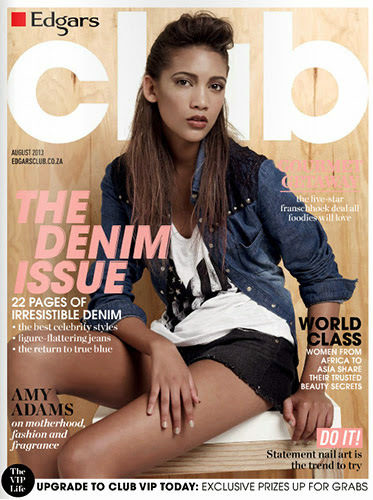 girl you rock! i'm seriously interested in this product now.